Rich Internet Applications developed by the experts at ANGLER offer superior accessibility, portability and scalability. Interactivity in websites is being adopted at a furious pace. In this light, the knowledge and practice of Rich Internet Applications (RIA) has become indispensable for website designers. Rich Internet Applications (RIA) are web applications that have the features and functionality of traditional desktop applications . We have tremendous experience with AJAX, Flex, Flash ActionScript and with effective use of Open source platforms available, we leverage on the existing tried and tested frameworks to effectively get the job done in time effective fashion. We create top-notch Rich Internet Applications using web 2.0 technologies such as Adobe Flex / Flash ActionScript, Adobe AIR, HTML5, CSS3, AJAX, PHP, JQuery and MS Silverlight. 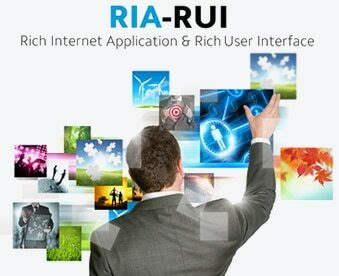 These Rich Internet Applications (RIA) solutions are web based applications that have the features of traditional desktop applications based applications with better interactivity and data communication. Our RIA services enable organizations to effectively communicate their ideas, products and services to their clients. These innovative solutions give the organizations a competitive advantage, allowing them to focus on other core business activities. Our expertise can help create a bridge between the legacy applications and the enhanced interfaces as per the client’s expectations. We offer unique approach, competitive pricing, quick turn around time and valuable customer service which has enabled us to successfully position at the pinnacle of the industry. Targeted – RIAs technologies give excellent background for development of compelling user interfaces that are completely focused on your and your customers needs, having the application design optimized for the purpose it serves. Responsive – due to specific technologies used, RIAs simplify complex processes (like registration or purchasing), save bandwidth and perform considerably faster than traditional Web applications, thus enhancing customers’ online engagement, guidance and feedback. Contact us to know more about our Rich Internet Applications development services and solutions or hire our RIA developers for your needs.